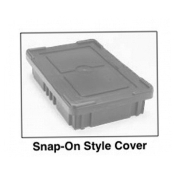 *When boxes with covers are lip loaded,box weight capacity must not exceed 25lbs. (11.3kg). **If totes are to be used with Kitting Carts, the insert cover must be used.